Prime Minister Narendra Modi on Thursday said that yoga has the power to unite individuals, society, country and the world at large, and has emerged as a major unifying force globally. "Yoga has become one of the most powerful unifying forces in the world. It unites individuals, families, society, country and the world," Modi said while leading the fourth International Yoga Day celebrations here in Uttarakhand. "In fact, Yoga Day has become one of the biggest mass movements in the quest for good health and well-being," he said. 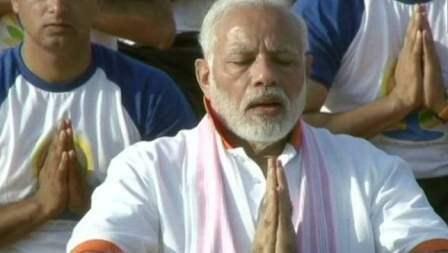 The Prime Minister said that yoga is beautiful because it is "ancient yet modern". "It is constant yet evolving. It has the best of our past and present and a ray of hope for our future. In yoga, we have the perfect solution to the problems we face, either as individuals or in our society," he said. In today's fast-changing times, yoga binds together a person's body, brain and soul, hence giving one the feeling of peace. "The way to lead a calm, creative and content life is yoga. It can show the way in defeating tensions and mindless anxiety. Instead of dividing, yoga unites. Instead of further animosity, yoga assimilates. Instead of increasing suffering, yoga heals," he said. He noted the International Yoga Day is being celebrated across the world. "From Dehradun to Dublin, Jakarta to Johannesburg ... people are celebrating yoga day all across the world."